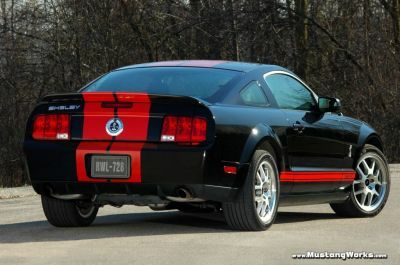 New limited-edition 2007 Ford Shelby GT500 offers Mustang enthusiasts a chance to hit the redline. 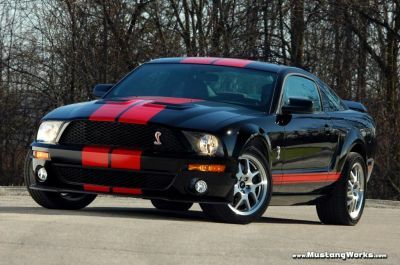 The Mustang line scores above the segment average in quality, according to the GQRS study, and the Shelby GT500 specifically scored the top result in the “sports car” segment. “The unmatched quality and power of the latest Mustang masterpiece explains why 9 out of 10 owners are completely satisfied with their overall ownership experience,” the April 2007 RDA Group report concluded. Enthusiasm doesn’t begin to describe the ongoing demand for the Ford Shelby GT500. In the hyper-competitive auto market where supply routinely surpasses demand, the Shelby GT500 still has a long waiting list of buyers. The Shelby GT500 was created by racing legend Carroll Shelby and Ford SVT and is a modern interpretation of the classic Shelby Mustang of the 1960s. Beneath the hood of every GT500 – including the new Red model – is a 5.4-liter supercharged V-8 engine officially rated at 500 hp. A 6-speed manual gearbox features evenly spaced gears that help provide a sharp, lively driving experience on both road and track. In addition to the engine upgrades, Ford’s SVT engineers retuned and upgraded key Mustang chassis components. Improvements include revised shocks, spring rates and upgraded stabilizer bars that help the Ford Shelby GT500 maneuver with authority. The GT500’s unique design features include wide upper and lower fascia openings with a functional air splitter. On either side, slanting headlamp openings add to the dramatic front appearance. The carefully tailored hood has heat extractors protruding near the leading edge, combining to provide improved airflow and aerodynamics. Ford Motor Company, a global automotive industry leader based in Dearborn, Mich., manufactures or distributes automobiles in 200 markets across six continents. With more than 280,000 employees and more than 100 plants worldwide, the company’s core and affiliated automotive brands include Ford, Jaguar, Land Rover, Lincoln, Mercury, Volvo and Mazda. The company provides financial services through Ford Motor Credit Company. For more information regarding Ford’s products, please visit www.fordvehicles.com.